Obama’s abuse of executive power and disregard for states’ rights is astounding. And the Democrats are going right along with his dismantling of the American Dream. Just a few days ago, the Democratic-controlled Senate voted down Senator Jim DeMint’s Land Grab Amendment, with which he attempted to block Obama from his secretly planned land grab of 10 million more acres of America. Now Obama is planning something even more insidious: he plans to put the Alaska Pipeline, the decades-old dream that Sarah Palin turned into reality, under the control of the executive office. Can you imagine that? How dare he! When will America say enough is enough and impeach this traitor! Those familiar with the players in this game believe that Obama’s true intentions are not promotion but sabotage of the pipeline efforts. Gary Jackson at A Time for choosing has explained in detail Obama’s political connections in Alaska and how he is planning to use his political hacks to seize Alaska’s pipeline. 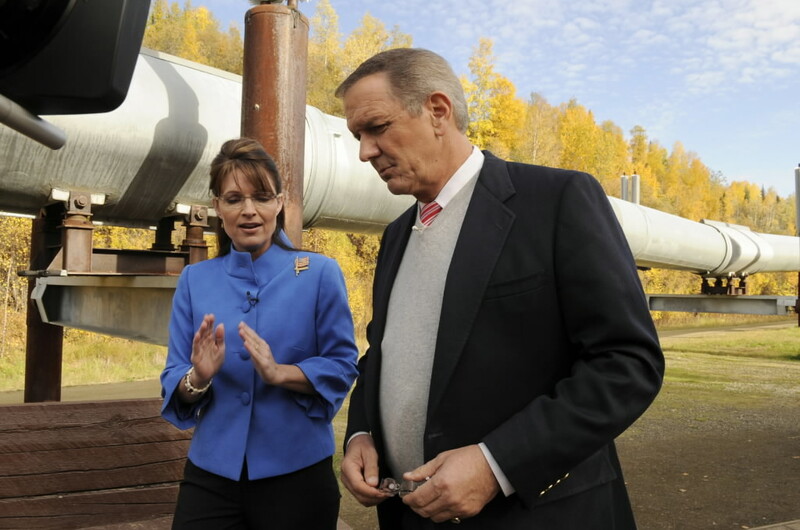 MelBryant at Conservatives for Palin has also written a detailed article about the proposed pipeline grab. So I won’t attempt to add to that discussion, but I strongly urge you to read their articles. Almost one year ago, C4P predicted that the president would eventually attempt to take over, and take credit for, Governor Palin’s work to get Alaska a natural gas pipeline (you can read more about AGIA here and here). Hawker said under the budget passed by the committee, the administration would receive 30 percent of what Parnell said was needed. It would receive the remainder when the Parnell administration shows that TransCanada successfully receives commitments to ship gas in an “open season” scheduled to begin May 1. “I’m looking to balance this so the Legislature can’t be accused of hamstringing or otherwise making it impossible for the AGIA process to continue forward,” Hawker said. Democrats said Hawker’s test would be impossible to pass, because the open-season process was only the beginning of negotiations. Rep. Les Gara said the “precedent agreement” that the budget called for was impossible to meet. Such an agreement is an unconditional bid to ship gas, while experts who have testified to the Legislature said to expect conditional bids as a way to begin negotiations. “There’s going to be no precedent agreement; we all know that,” Gara said. Gara warned that withholding the money sought by Parnell could delay the state’s ability to meet its commitments under AGIA and could weaken the state’s hand in forcing BP, ConocoPhillips and ExxonMobil to develop a pipeline. It might be worthwhile to note here this bit of information from yesterday’s article at Juneau Empire. It looks like Obama’s hacks in Alaska are already at work doing his dirty work for him. It is time for Americans to stand with Governor Palin and Governor Parnell to block this egregious abuse of power by the Obama Administration and its minions. It is time for Americans to stand up and speak out on this and other issues – while there still is time.